Home › News › It’s the Daily Mail, but this is such a well written article – Please Read! It’s the Daily Mail, but this is such a well written article – Please Read! Through two World Wars and a plague which all but wiped its species off the face of the earth, this magnificent elm has endured everything the fates could throw at it. Planted by the Victorians, it is not only much-loved by its neighbours but it is an entire ecosystem for an endangered species of British butterfly. Indeed, the grand old elm on Sheffield’s Chelsea Road — a rare survivor of the Dutch Elm epidemic which ravaged Britain a generation back — recently won a national prize. In the Woodland Trust’s latest annual contest to find Britain’s favourite tree, this mighty candelabra-shaped beauty came second. Having won this arboreal Oscar, you might imagine that Sheffield would have slapped some sort of preservation order on the noble elm. After all, this is a city which prides itself on having more trees than any city in Europe. You might expect local politicians to be queuing to shake it by the branch and have their photograph taken next to it. Wrong. For it has now been scheduled for the chop. 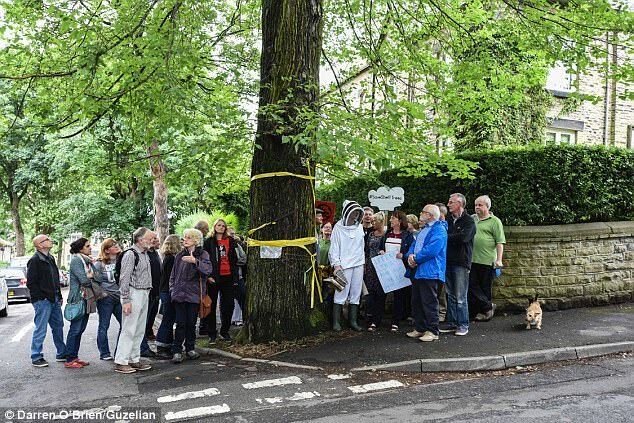 Despite petitions and protests by thousands of people, Sheffield City Council has earmarked the city’s best-known tree for imminent destruction, arguing that its roots pose a threat to both road and pavement. ‘Serious decay,’ says the council, reeling off a list of essential works, including the removal of a branch. ‘Utter rubbish,’ say the locals who have covered its lower reaches in love letters and yellow ribbons. They argue that the tree merely needs maintenance work which the council has failed to carry out for years. 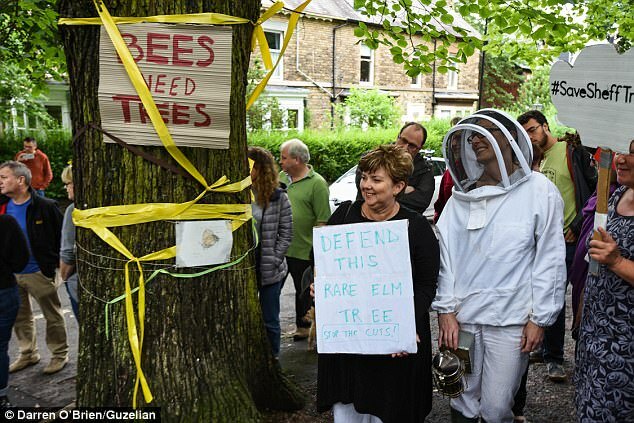 What is perhaps even more astonishing, however, is that the council is now threatening injunctions against local residents — including one of its own councillors — warning of punitive legal action if they dare to protest in defence of this tree or thousands of others which have been earmarked for the chainsaw. In one case, the jobsworths may be about to axe more than 20 healthy and much-loved trees which were planted as a war memorial. As a result, there is now daily confrontation between the locals and the tree-choppers. I arrive in the tree capital of Britain and Europe to find a game of cat-and-mouse between a well-organised army of residents and, on the other side, the council and the Spanish contractor recently awarded a £2.2 billion 25-year contract to maintain its roads. In no time, I find a neighbourhood posse — ranging from a businessman to a children’s book illustrator — ambushing a chainsaw gang as they attempt to chop down a healthy lime tree. After nearly three hours of impeccably polite stand-off, the choppers retreat. This is no mere neighbourhood spat. It is a municipal civil war. No one has the slightest objection to the council chopping down any tree that is damaged, dying or posing any threat to anyone. But people of all ages and backgrounds are furious that perfectly healthy trees are being pulped simply because it is easier for the road maintenance team to get out the chainsaw than to apply fresh Tarmac and a bit of common-sense whenever a root starts poking through. After all, many cities are full of trees which grow like this. This is a story which extends far beyond Sheffield. At issue is the delicate balance between bureaucracy’s obsession with box-ticking conformity and mankind’s need to connect with Mother Nature. Here we have a council prepared to chop down Britain’s second-favourite tree on the basis that it is causing a bump so minor that even one of those compensation-chasing fraudsters who trip over paving stones and then rush to a lawyer would be hard pushed to take a tumble. I had set off for Chelsea Road, in the hilly Sheffield suburb of Nether Edge, expecting to find its famous elm in a dreadful state. Why else would the council want to bring it down? Surely, it would be a gnarled old thing with gammy roots sprouting through the road and footpath, making it all but impassable to anyone with a baby buggy or wheelchair. Not a bit of it. Standing proudly on a crossroads, it seems in excellent shape rather than a state of ‘severe decay’, as assembled campaigners are only too keen to point out. Dr Nicky Rivers, living landscape manager from the Sheffield & Rotherham Wildlife Trust, and a team of experts have studied this tree for years. For it is home to a colony of the white-letter hairstreak butterfly, a rare species whose only foodplant is elm trees. Predictably, the damage inflicted by Dutch Elm disease has made it even more endangered. This colony will spend its entire life here without ever moving from this one tree. ‘What really annoys us is the council’s complete lack of transparency,’ says Dr Rivers. The council insists it will not accept funds for individual trees and that £50,000 is the cost of raising the entire junction to ‘comply with the Highways Act’. Completely unnecessary, says Matt Larsen-Daw of the Woodland Trust. He points out that this tree was probably planted at the same time as the handsome Victorian villa next to it. Back in those days, Sheffield was world-famous for its steel production. But with all this industry came great pollution. With that in mind, civic elders planted trees all over the place to soak up the grime and make the city a prettier place. As a result, Sheffield has some 36,000 street trees just like this lovely elm. Yet the council and its contractor, Amey (a subsidiary of Ferrovial, the Madrid-based giant), has decided 6,000 trees — many healthy — must go. The council points out that every old tree will be replaced by a new one. But the campaigners believe many are being axed simply to make life easier and cheaper for the road contractors. A big old Victorian tree with roots under the road will require more attention than a flimsy young sapling. Indeed, when the council removes an old tree, it won’t always replace it with the same species. In many cases, it has chosen what some locals call ‘lollipop trees’ because of their small, pert shape. Unsurprisingly, a city that prides itself on its trees as much as its steel is unhappy about seeing great old oaks, limes, planes and elms making way for glorified shrubs. While the council uses the phrase ‘tree replacement’ rather than chopping, locals say these are weasel words. I ask the neighbours their views. Not one believes the tree poses any danger and nearly all want to see it stay. Ian Fullerton, 63, used to work for the Forestry Commission and remembers the Dutch Elm saga all too well. ‘It did terrible damage and yet this tree survived. We should be breeding from it, not chopping it down,’ he says. He poo-poos any notion that the tree is a hazard to road maintenance. ‘They dig up this road the whole time to lay cables and pipes,’ he says. The council insists there are ‘increasing safety concerns’ about the elm and that it will do all it can to preserve the white-letter hairstreak butterfly. According to Bryan Lodge, council cabinet member for environment, it is looking at all options to give the butterfly the best chance of migrating elsewhere. Yet Dr Rivers points out this is virtually unheard of. Besides, the butterfly only lives in elm trees and there is no alternative nearby. I meet Prue Phillip, 73, a retired film editor and member of the local tree campaign. Her group have tied yellow ribbons around every tree on death row and encourage people to contact them whenever they see an Amey team appear with ropes, saws and a woodchip machine. ‘We’re not a bunch of tree-huggers,’ she explains. By now, the jungle drums are beating. Word has spread that the hatchet-men are in nearby Rundle Road and starting to chop branches off a big lime tree. They will remove it within an hour or two. He says protesters are invariably polite and sometimes offer them cups of tea. ‘I’ve only had one bloke threaten me,’ he says, adding that his most memorable moment was when he started chopping and resident emerged with a cello to play a funeral lament. One protester, telecoms consultant Graham Turnbull, says he’s just received a letter from the council threatening him with an injunction and a hefty fine. Inevitably, this is a legal haystack. Earlier this year, South Yorkshire Police used trade union laws to arrest several people for attempting to hinder others from going about their work. However, this strategy was rejected by a judge and the city’s police commissioner agreed. The police have since decided that they have more important things to do. Thwarted in its attempts to criminalise protesters, the council has decided to take the civil law route. It has been monitoring social media and photographing protesters to draw up a list of targets, such as Graham, and is threatening them with penalties. So far, 17 people have until next week to sign letters promising to behave or else face an injunction. They include Alison Teal, a Green Party councillor who was arrested in February, only for charges to be dropped. She’s now seeking legal advice about the injunction warning, but is exasperated by the bovine attitude of the council on which she sits. A couple of miles away, I find another passionate campaign in Western Road. In 1919, the local primary school — still thriving on the same site — lined the street with alternating sycamores and plane trees, one for every former pupil killed in the Great War. A plaque on the school records this act of commemoration. But now, 23 of the trees are being considered for the chop. ‘When someone defaces or urinates on a war memorial, they are, quite rightly, in big trouble. This is even worse — they’re destroying it,’ says Alan Story, a retired academic. When he followed a chainsaw gang the other day, he was photographed by contractors. He cheerfully calls himself ‘an old Leftie’ but is appalled that a Labour council should try to curtail his right to protest. ‘Can you imagine trying to tell Jeremy Corbyn that he is not allowed to protest?’ he asks. Councillor Lodge insists he supports peaceful protest but adds: ‘There’s a clear distinction between this and direct action.’ The ‘vast majority’ of Sheffield residents, he says, are on his side. I walk up and down both sides of Western Road. The trees provide a glorious canopy over what would otherwise be a much duller thoroughfare. The condemned specimens have a yellow ribbon, a poppy and, in some cases the name of a dead local lad — men such as Sydney Eggington and Joseph Richmond, both killed with the Sheffield ‘Pals’ at the Somme aged 21. Certainly, some tree roots are pushing up the pavement in places. But it would not be beyond the wit of a moderately intelligent asphalt gang to smooth over the bumps. It’s home time at the primary school. The parents are unanimous that the problem has been caused by years of council neglect and that the trees should stay. There are countless similar examples to be found all over the country. For example, locals in Bristol are trying to stop an ancient oak being felled merely to allow alterations to a branch of Burger King. Here in Sheffield, this heroic elm on Chelsea Road could, tragically, be firewood by the end of the month. This is not merely officially-sanctioned vandalism. It is utter lunacy.